The end of summer vacation and back to school happens all to soon for some of us. Despite our love of teaching students, leaving a great summer filled with fun and relaxation still is hard. Judging from my PLN on Twitter and Facebook, many of you are already back for at least a week, some two. Still, it’s not to late to explore great resources from Discovery Education, the educational gift that keeps giving. Check out COOL new ways to explore alternative fuels and the science of engineering during the last weeks of summer vacation. With all-new family activities for all grade levels, students can explore eco-friendly ways of traveling on a family road trip or use a bike to investigate vehicle efficiency. 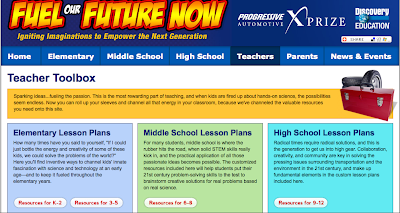 Also online at www.FuelOurFutureNow.com, students can satisfy their need for speed and test drive investigative skills with dynamic videos and interactives. PLUS: Don’t miss the Teacher’s Toolbox with custom curriculum, supplemental lesson plans and links to other great resources. Accelerate your summer fun at: www.FuelOurFutureNow.com!